Creative and clever, this project will be treasured. 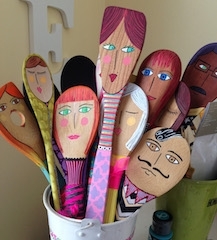 Fun for the entire family, we will use our creativity—as well as paint, paper and pencils—to turn wooden spoons into imaginary characters or mini self portraits. Together, you might create a whole family of spoons. This is a delightful craft accessible to many ages and abilities, and a perfect way to prepare a special family gift for Mother’s Day or Father’s Day. Tuition includes a $10 materials fee per pair. Ages 7+.